About a year ago, I wrote a blog post discussing ways that you could integrate Adobe SiteCatalyst and Tealeaf. In that post, I talked about some of the cool integration points between the two products. In this post, I’d like to talk about how the same integration would work with ClickTale and share some cool new things that are possible that go even beyond what is possible with Tealeaf. 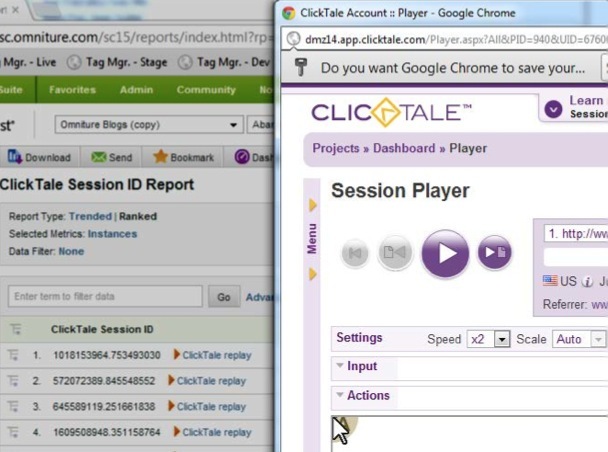 For those unfamiliar with ClickTale, it is an in-page analytics tool that allows you to record website sessions, filter them and play them back. It is often used to see heat maps of pages and to “watch” website visitors and includes even their mouse movements. It is pretty cool technology since often times the best way to get internal stakeholders to understand website issues is to have them watch real users encountering issues. Once you do this, it is possible to open the preceding ClickTale Session ID eVar and see a list of all of the ClickTale session ID’s that match this segment. But as I noted in my preceding Tealeaf post, one of the frustrations of this type of integration is that once you isolate the session ID’s that you want to watch, you are stuck. You have to copy each one individually and then switch to the other application (i.e. Tealeaf) and then start the process of watching the session. My wishlist item in my previous post was that this process could be simplified so you can simply click and view the session, right from within SiteCatalyst. Believe it or not, doing this is now possible! 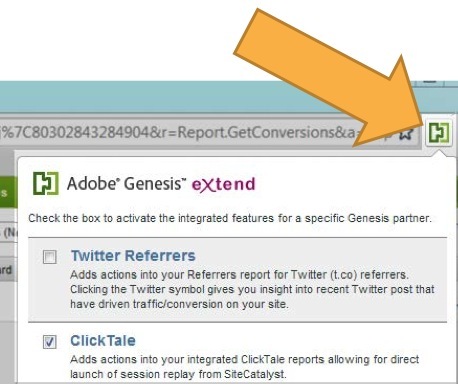 Thanks to the creation of Genesis Extend (still in Beta), you can add a Genesis Chrome browser extension to your version of Chrome and get the ability to streamline this process for ClickTale (not Tealeaf unfortunately). You will notice that there is a ClickTale box you can check (and also one for Twitter which allows you to see actual Tweets in referrer reports). From here you can enter your ClickTale authorization credentials and you are ready to go. It is also possible to use this new SiteCatalyst eVar to copy a list of ClickTale ID’s and paste them right into ClickTale to create a segment and look at heat maps for just those ID’s. 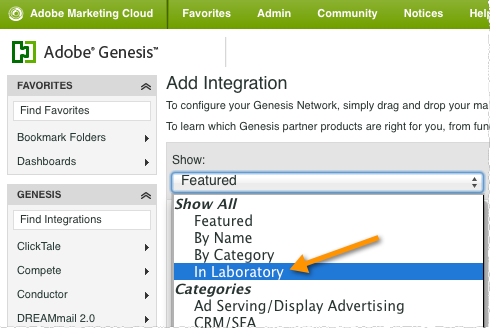 As you can see, this is a cool interface integration that is possible since both SiteCatalyst and ClickTale are “cloud” products. I would expect that you will see more of this in the future in more browsers or even natively as part of SiteCatalyst. If you are a ClickTale customer and use SiteCatalyst, you should definitely try this out! * You say “free” but when I go to add it I get dire warnings about costs. Adobe tends to charge for ridiculously trivial “integrations” so it wouldn’t surprise me. * Where do I find the ClickTale API key in the ClickTale interface?